Celebrated on the 5th day of the 5th month of the lunar calendar, the Dragon Boat Festival also known as Duan Wu Jie can trace its roots back to the Chu State of the Zhou Dynasty. The Dragon Boat Festival is celebrated the world over by the Chinese. One of the most popular legends behind the festival is the one about Qu Yuan, a Chu State official and poet. Qu Yuan was known for his criticism of corruption in the Imperial Court. He was eventually exiled and began writing poems for which he is still known. When the Zhou was overthrown by the Qin Dynasty, Qu Yuan was so despondent he threw himself into the Miluo River. According to legend, villagers in the surrounding area rushed to his rescue and threw rice dumplings (zongzi) into the river to prevent the fish from feasting on his body and fishermen paddled up and down the river in their long boats in search of Qu Yuan while beating on drums to scare away the fish. Since then, Chinese people have commemorated Qu Yuan by eating zongzi and racing dragon boats egged on by a chorus of loud drum beats. 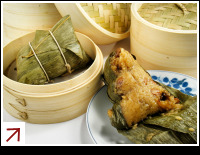 Zongzi are delicious dumplings usually shaped like a pyramid and wrapped in fresh bamboo or pandan leaves, glutinous rice filled with meat, dates and nuts, and steamed until tender. Dragon boat racing has also become a popular way of observing the festival. When is the Dragon Boat Festival in 2013, 2014, 2015, 2016, 2017?